As a business owner, it can be tough to take criticism from customers, especially in an open, public forum like the internet. After all, a bad review from a customer is a direct insult to all of those countless hours and nights you’ve put into building our business! This business is your baby, and now someone has spoken ill of it, or worse – completely trashed it. Who wants to be told they have an ugly baby? Well, life isn’t fair. And in the game of business, you have to come to the field prepared to play. Hopefully you learn something while you’re there, too. As both a business manager / owner and consumer, I can tell you that I’ve seen all the right ways – and wrong ways – to deal with negative reviews and slanderous customer comments. It can be tough, but the following tips will help you maintain the best online image of your company and may even “steal the thunder” of those pesky, undeserved “hate reviews”. Side Note: There is no substitute for actually caring, and actually providing good customer service. DO NOT go posting things like this to review sites without actually meaning them or going through with them, or your reputation will suffer big time in the long run! This isn’t a way to manipulate your image online. It’s simply a guide on how to respond to unhappy customers that leave bad reviews in the most positive way, so you can make an unhappy customer happy, create a realistic picture of your reputation online, and win more business. Ok, let’s get started! #1 – Don’t be silent. First of all, you have to respond to bad reviews, and promptly. If you don’t, you’re leaving judgement up to the readers of these reviews, and believe me, they are being read more often than the good ones! No response is the same as saying, “I don’t pay attention to negative reviews of my business, so I’m probably not paying attention to customer service at all.” Remember, in the absence of communication, people assume the worst! Do you really want your reputation to be left to chance? Even if the review is slamming you personally, and defaming your entire organization in the worst way possible, you should respond. Not doing so just makes you look – well – like a one-star kind of organization. Also, responding to negative reviews promptly (at least within 24 hours) will show that you are indeed vested in customer satisfaction – not only to the unhappy customer, but to other potential customers as well. Remember: you don’t want other review readers to be swayed by the negative reviewer’s reviews. (phew, that’s a mouthful!) Studies have shown that fully 95% of unhappy customers are willing to do business again with a business that is able to make amends. One thing you can do is to make sure you’re monitoring all of the pertinent review sites for activity. Create a process for reviewing them frequently, and assign someone in your company to be responsible for responding promptly, and within your guidelines. Oh, and make sure they’ve read the rest of this section! #2 – Keep a cool head. So our advice when responding to a bad review is to just “relax.” Take a few minutes to breathe & think. Don’t write a knee-jerk reaction to a review. Think about how you can turn a bad situation into a good one, by following the advice below. You should almost always work in an apology to your response. First, it shows you actually care. Second, it shows everyone else that you are owning up to your mistake because you’re not perfect. People will actually get behind that sort of humility, because it reassures potential customers that if they have a similar experience, they won’t be left to fend for themselves. You’ll try to make it right. That could actually end up helping you in the long-run, don’t you think? But who says the customer is always right? Admittedly, they aren’t always right. Sometimes they’re just dead wrong. They could be totally insane and saying crazy things that never happened. BUT…you can’t tell them that, even if you are right! What you CAN do is offer a response that doesn’t point fingers, but instead attempts to resolve the customer’s concerns, and makes you look like you want to do the right thing for the customer. You do, don’t you? One of the best methods to turn an unhappy customer into a happy one is to give them something for free! Who doesn’t like free stuff? It’s like saying, “Whoops, my fault. Let me make it up to you.” You could also offer a discount on future service, or if the customer is pissed off enough, a complete refund. What you offer is up to you, and it depends on the situation. Some business owners literally ask unhappy customers, “What will it take for me to make this up to you?” And they are prepared to accept whatever the customer says (within reason) – up to a complete refund of the product or service. I like to think of this as the “Amazon mentality.” Customers love shopping on Amazon because they will take returns on almost anything; even a shoe that just doesn’t fit right, and pay for return shipping! It’s in part that commitment to customer service that made them so successful. Maybe we can learn a lesson here. You will need to judge the customer, the situation, and your business, but offering amends like this is a great way to earn back someone’s trust and show them you’re willing to suffer a little bit to earn back their business. Again, customers who take well to these attempts could end up being great customers in the long run. #5 – Create a Positive. Imagine reading this if you were looking for someone to hire to come into your home. It highlights the fact that 1) you have thousands of customers over 2) a long period of time and 3) this seldom happens but 4) you’re willing to own up & make things right because of your 100% satisfaction guarantee. 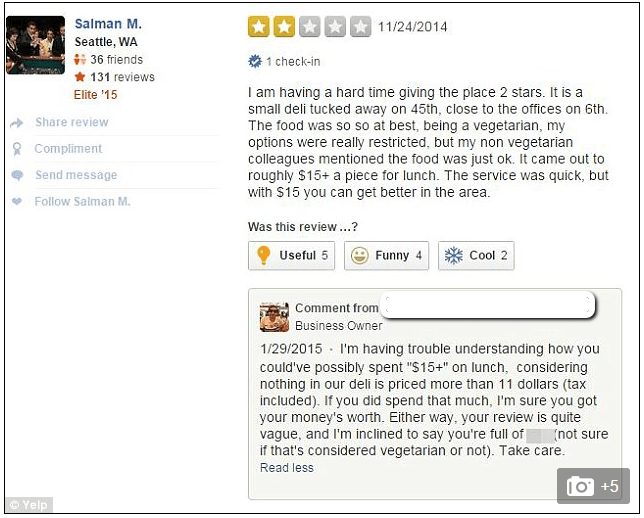 There you took a negative review and put your company in a positive light. And although you’re not necessarily winning any customer service awards with this, you can be assured that anyone looking at your reviews here will see the effort you’re putting in to make customers happy. And that will mean more business for you in the long run. Side Note: Be careful with the way you word responses like this. You don’t want to come off as condescending or passive aggressive, such as writing, “Jim, we’ve been in business for a really long time and have served thousands of happy customers, and you’re just one of a few unhappy ones…” That might be taken as you saying the customer is wrong and their situation isn’t important. It’s a good practice to write a response and have at least one other person look it over before posting until you have a good feel for writing with a friendly tone. #6 – Do Your Best, and Learn Something. Okay, that’s actually two things. But they really are connected. Because despite doing your best, there will be those customers that are just chronic complainers, trying to get something for free, or no matter what you say they are going to post bad reviews about you all over the internet. Just remember that every business deals with these types of customers and there’s only one thing you can do about it: get better. You have to have the attitude that you are going to do your best to create a high standard of service, implement systems that will create accountability in your company for those standards, stay on top of satisfying unhappy ones when they pop up, and learn something from each instance so you can continually improve your business. And if you do this with sincerity, you will have a sterling online reputation, despite the bad reviews you (will) get. And that translates directly into dollars and revenue for your business. #7 – Use a System. In order to really stay on top of something like this in today’s world of myriad review sites, it’d be a part-time job, right? Actually, no! With review camp, you can put in place systems that will automate and largely relieve you of the time-consuming tasks you’d otherwise need to do, plus help you build a brand online that has that sterling reputation. Send you alerts each day to your inbox of new reviews on sites you monitor, so you can respond to them quickly & efficiently. Send you automated reports so you can hold yourself and your team accountable to create a great online reputation. Build trust with customers by showing them actual reviews from around the internet (not ones you posted…) directly on your website, increasing your website conversion rates. Give angry or unsatisfied customers a chance to vent first BEFORE posting a negative review, giving you & your team a chance to create a happy customer & prevent a negative review from ever happening. That’s not all, either! We aim to help your business create the online reputation it deserves. To learn more about our service, you can schedule a personalized demo and see all of the great features, or sign up for one of our affordable, no-commitment plans.